Have you ever been on a road trip that has scared the hell out of you? Well, don’t answer unless you have been to these scariest roads of India. The vast country is full of diversity and surprises, and its geographical territory boasts of towering mountains, vast plains, and deep valleys. There is a different landscape and terrain at every turn. As the roads penetrate through those wide and varied terrains of India, at times, going through them is like walking on a tight rope. What may add to the scary roads is the pathetic road condition and dangerous weather. Even the most seasoned and expert drivers need to be very careful when driving on these roads. When you drive through these roads, you can never forget the experience all through your life. The memories of driving on those narrow roads over low hanging cliffs and sharp turns are sure to give you goosebumps even if you manage to reach your planned destination safely. 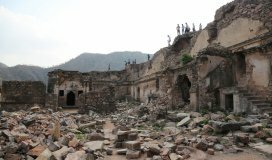 Here is a handpicked list of the scariest roads in India. 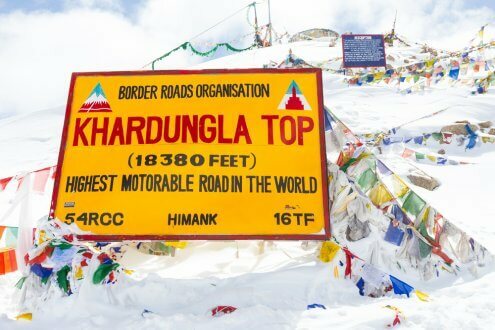 Located on the Silk Route between India and China, the road to Khardungla Pass will take you to that sheer height of 5,602 m above the sea level. What adds to the scary part is that the road is not paved and remains slippery because of the mix of frozen ice and dirt. And if that was not enough, those hairpin turns do give nightmares to even the most expert drivers. 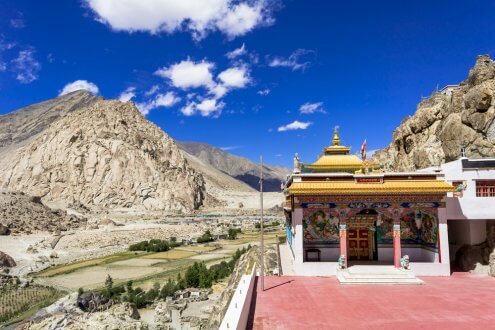 Located between Ladakh and Kashmir, what makes the frightfully narrow slippery road even scarier is its altitude of more than 3000 m. The road gets even more muddy and slippery during the rains, and those frequent landslides make it a nightmare to travel on. The road is taken by those travelling to Leh from Srinagar. As Chang La remains covered with snow all through the year, it is tough to drive on this road between Pangong lake and Leh in the Ladakh region. 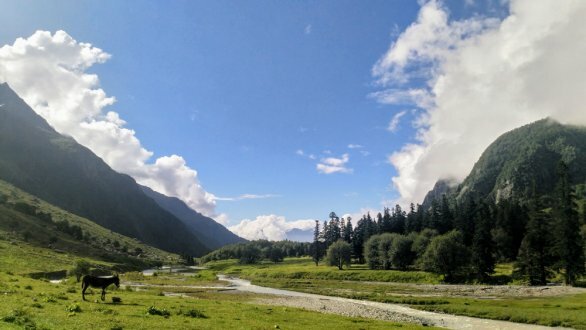 It is the third highest motorable route in the world, and you are sure to experience lots of breathlessness and nausea when you travel on the road. At an altitude of more than 5000 meters, it surely is one of the scariest roads in India. 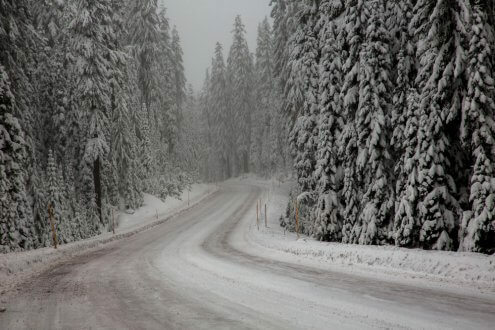 The slippery snowy road, low temperatures, and scarce oxygen in this region make it a tough road to drive on. Another scariest road in India is the National Highway 22 that starts at Ambala and takes you through Haryana and Himachal Pradesh. Another nickname for this road is ‘highway to hell,’ and it is considered to be one of the most dangerous highways. On the route, you cross some really dangerous mountains, go over cliffs and pass through a number of dark tunnels. The road has featured in History Channel’s ‘IRT Deadliest Roads’ series because of its hazardous conditions. 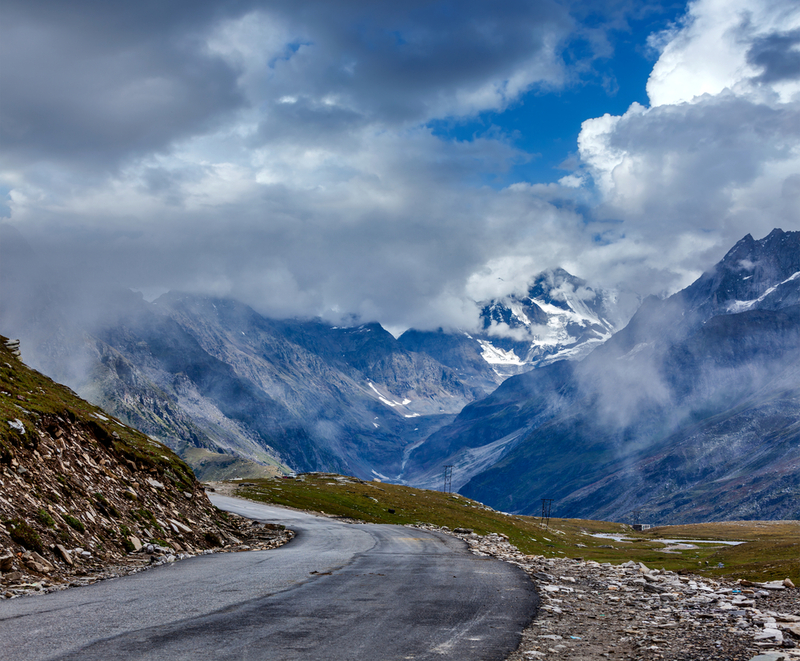 The name Rohtang indicates ‘ground of corpses’ and is enough to signal the dangers that lurk on this scary road. Although Rohtang Pass is a favourite tourist spot and regularly traversed during the tourist season, one must be aware of the dangers associated with the road on Leh-Manali Highway. The higher elevation of the snow-covered road at almost 4000 meters is prone to landslides, which make it a dangerous road to travel on. 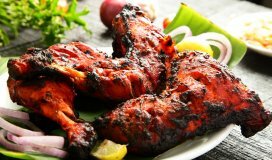 The extreme climatic conditions make it even riskier. The Zig Zag Road in Sikkim, located at the height of about 11,000 ft, is sure to reward you with magnificent views of the Himalayas. However, there is great danger lurking every minute you are on these winding roads. You are sure to get dizzy as the three-level zigzag road takes you across the mountainous terrain. You need special precaution when travelling on this road, and it is undoubtedly a journey not for the faint-hearted. 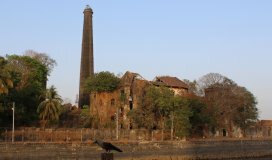 The nine-kilometre road from Neral to Matheran is considered very dangerous because of its slippery condition and sharp turns. The vehicles driving on this road are slow and careful because of the narrow sections followed by sudden hairpin turns. There are no safety rails, and to add to the risks, there are constant landslides during the rainy season. Thus, it is indeed one of the scariest roads in India. 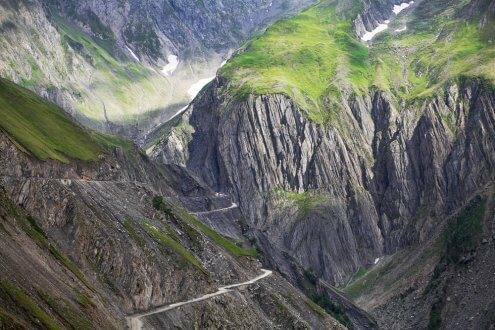 What makes Kinnaur road scary are those dark, narrow holes and cliff-hanging drives. You remain tense and scared all through the trip, and do not dare to look at the deep valley on the side with the Baspa River. Even a small mistake could send you plunging down. Thus, one has to be extra cautious when driving on this road, as it is already in famous for many accidents and lost lives on a regular basis. During the winters, the valley road remains closed because of heavy snow. 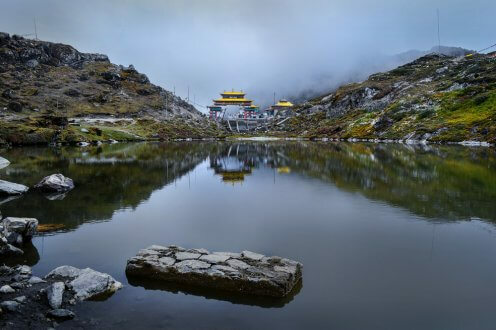 Nathu La Pass is situated at the height of about 14,000 feet, and what makes the route tricky and dangerous is not just the height but also the heavy snow on the route. Moreover, some steep turns and landslides add to the risk of driving on this route. The road often gets blocked during winter because of heavy snow and landslides. It is indeed not easy to drive on this road. 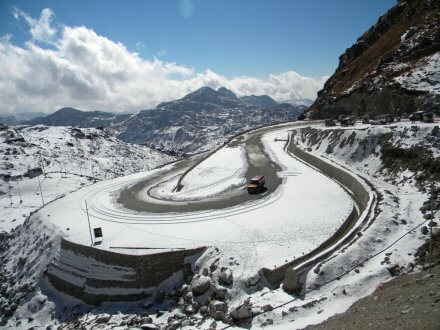 Another road that can give you nightmares is the Sela Pass that links the Tawang Town to Guwahati. What makes the road scary is the higher elevation of about 4000 meters above the sea level. Moreover, those sharp turns and slippery curves can be fatal for anyone driving on this road. What adds to the woe of the drivers is that the road remains covered with snow most of the time. One has to be very vigilant when driving, and drive really slow when crossing the Seal Pass. 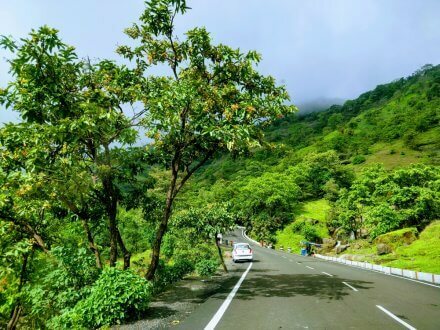 If you are an adventure lover, then mere driving on these roads will give you chills of your life. Every hairpin turn will become a mission to accomplish. 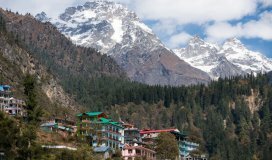 While you are in India and like to dare, try traversing through some of these roads. However, for safety reasons, it is suggested that you should not drive on your own and should hire an expert terrain driver for the purpose.